They have a lot to thank Kevin McDonald for too. Had Big Kev not scored that clinching third goal then Chris Iwelumo was about to come on and their chances of getting on the pitch would almost certainly have disappeared. 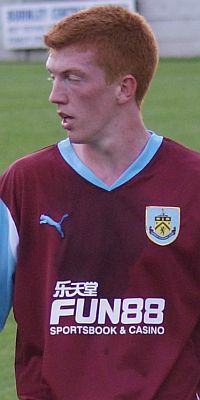 However, the two youngsters got a few minutes each, got great receptions from the travelling Burnley supporters, and thanks to manager Brian Laws, who alerted them, both families were there to see them make their debuts. For those of us with an interest in youth development at Burnley, for those who go to watch the youth team, it really is something special to see some of the lads get their chance in the first team, and as I reported earlier, for me, this really was the icing on the cake last night. The manager was equally delighted for them and said: "I was desperate to get the lads on for an appearance. They have had a good pre-season with us and Michael, in particular, has shone through. "Alex-Ray Harvey has done well, as has Wes, so it sends out a message to the young lads that they can be involved and even just having a few minutes will make them feel ten feet tall." Harvey, who is currently injured after picking up a knock in the friendly at Padiham, and Fletcher were both in the squad that went to Singapore, but King, who has just joined the professional ranks made a huge impression with his early season form. "We have already stated what we want to do with the development squad, and that is to accelerate them into the first team," Laws added. "There are three who have stood out for me over pre-season and are penetrating the first team squad and that is brilliant news for the club. "They have joined in during training and that is always great testament for the young pros, as the first team players can be very vocal with them, so we get to see whether or not they get intimidated by them. "I am not going to build them up too much because that puts too much pressure on, but the likes of Michael handle the pressure well and handle the mental side too, and hopefully they will be staying with the squad a lot longer."